The block is scheduled to be finished in 2018. 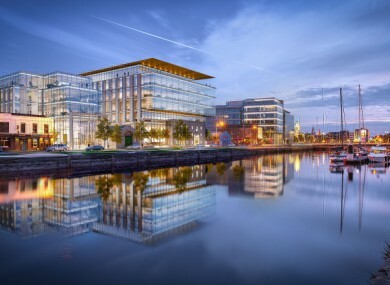 CORK IS GETTING a new six storey office block at Albert Quay in the city’s docklands region. Construction on the €90 million development is set to begin this year and it’s proposed that it will be completed by the autumn on 2018. Cork City Council have now given the green light for the plans which are being put forward by the Owen O’Callaghan owned O’Callaghan Properties. In total, four different buildings will built on the 2.25 acre site bounded by Albert Quay to the north, Victoria Road, Albert Road and Albert Street. The developers had previously planned to build an events centre on the site but planning permission was rejected. The events centre will instead go ahead at a site on the site of the former Beamish and Crawford brewery. The project has been designed by architects Henry J. Lyons and it’s estimated that the development will be capable of hosting some 3,000 people. The developers also say that the project will create 350 jobs during its construction. It’s envisaged that the development will include roof terraces with restaurant units and staff facilities and developers are claiming that the office block will appeal to younger workers. “The location is at the centre of public transport options and just a few minutes walk from the city centre,” O’Callaghan said. That will certainly appeal to the young employee demographic characteristic of enterprises in the new economy. Email “Cork is getting a new €90 million office block ”. Feedback on “Cork is getting a new €90 million office block ”.